Australia’s largest ever trade and business delegation to China has landed in the Far East. Prime Minister Malcolm Turnbull is leading a delegation of around 1,000 business leaders on a trip that will feature talks with President Xi Jinping and Premier Li Keqiang. As the Chinese economy shifts to focus on services and middle-class consumption, the talks come at an important time for the economic relationship between China and Australia. Here are five things to know about the economic ties between the two countries. 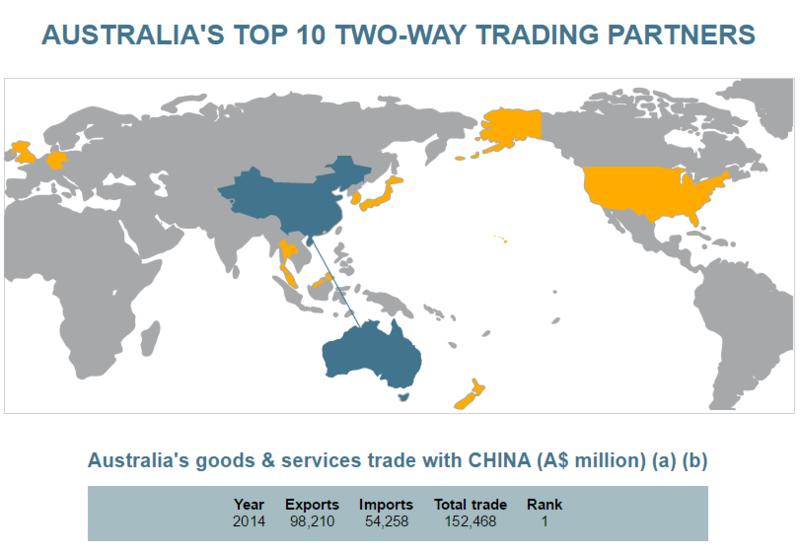 In 2014, China accounted for 34% of Australian exports. This made them Australia’s top export market with a total value of around AUS$98bn, according to the Australian Government Department of Foreign Affairs and Trade . China is the biggest market for items including Australian agricultural produce and energy products and services. Over the past 10 years, Australia has seen the second highest volume of Chinese direct investment. From 2005 to 2015, only the USA had a higher accumulated total. Over this time, Australia received nearly US$80bn in Chinese ODI (overseas direct investment) and in 2015, Chinese investment grew by nearly a third (in US dollars) to US$11.1bn. Nearly half of Chinese investment was in real estate last year. A KPMG report conducted alongside the University of Sydney estimates real estate investment hit AUD$6.85bn in 2015. This investment was almost exclusively focussed in just one state – New South Wales, a region including the city of Sydney – which accounted for 94% of the total. 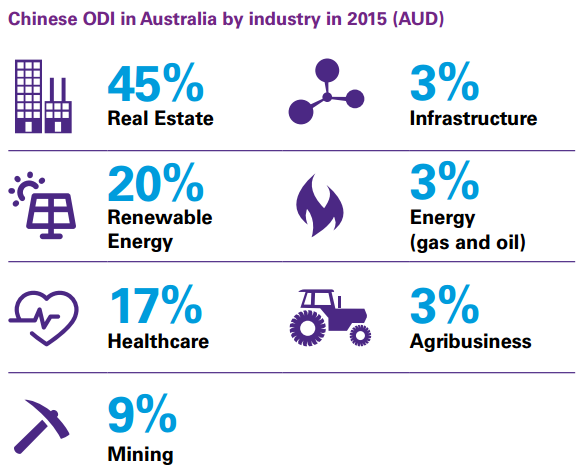 Renewable energy and healthcare followed next as top investment areas. Renewable energy’s second place was the result of one very large deal between China’s State Power Investments Corporation and Pacific Hydro. The China-Australia Free Trade Agreement has been in force since December 2015. Based on 2014 values, more than 86% of Australian goods exports to China now enter duty free. This should rise to 94% by 2019 and 96% by 2029. Australian tariffs on Chinese imports will also be progressively removed. The agreement is also set to increase Chinese tourism to Australia, and relaxed rules for labour mobility will see more Chinese workers in Australia and vice-versa. According to the International Institute of Education, in 2014 there were over 90,000 Chinese international students studying in Australia. This is significantly more than the rest of the top five combined, with a third of all international students in Australia from China. In 2014, The Australian Business Review described education as “the quiet champion of Australian exports”. This influx of students brings massive economic benefits to Australia, in tuition fees and other costs while they study. But, as the Deputy Governor of the Reserve Bank of Australia, Philip Lowe, explained in a 2014 speech , it goes beyond that. Can the world adjust to China’s ‘new normal’?